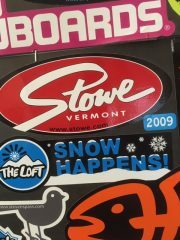 Businesses shopping for custom stickers, decals or labels have several design and buy options: 1) Design in-house and send to one of many on-line printers. 2) Pay a graphic designer to develop designs and send off to those same manufacturers. 3) Utilize a design and development firm that can also handle all manufacturing needs. Not surprisingly, I would argue (and often have in this blog) for the last design and print option. 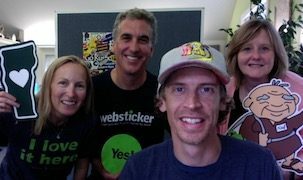 There are many reasons for this including the creation of stronger stickers and lower costs, but, in this blog I’d like to look at an often overlooked advantage of having a marketing firm like Websticker handle your design. And that is the no-cost or low-cost branding and identity benefits that can come from sticker design and development. Many clients of Websticker take advantage of free sticker design to not only get powerful promotional stickers, but also end up using the created designs and concepts in their overall marketing efforts. Because the nature of an effective sticker design is to be simple, eye catching, cool, and badge-worthy, sticker designs often lead to new, stronger, alternative presentations of existing logos or even lead to an entirely new business identity. Many small businesses do not have the resources for logo and identity development from larger agencies. 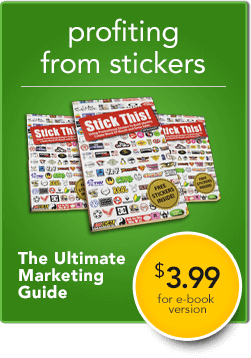 With a small sticker marketing firm like Websticker clients not only get a low-cost marketing tool in promotional stickers, but can use designs on other custom promotional items and in other advertising efforts. Not all design can be free, of course, as often completely new logos, slogans, products, and custom artwork may be needed. But, even in these cases Websticker has put together flat fee design and development packages, perfect for small businesses developing sticker products, promotional stickers, or just in need of identity boosting creative designs and ideas. 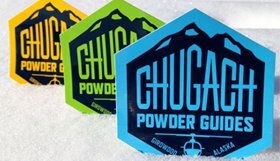 Effective promotional stickers should be a microcosm of your overall marketing efforts – maximizing exposure, starting conversations, and a strong representation of your unique and needed service or product. Thus developing a powerful sticker design for your company can also be a valuable hack on improved identity and marketing efforts.